Agaete is a small village in the north-west of Gran Canaria. It's a traditional fishing village, 30 km from the capital city of the island - Las Palmas de Gran Canaria. It is one of the most beautiful places of Gran Canaria, offering an interesting contrast between the sea landscapes and green valleys that stretch towards the center of the island. The climate is warm and mostly dry. The “Plataneras” (bananas plantations) occupy most of the slopes of the coast. Agaete is a village of white houses located next to a bay. The port of Agaete has direct ferry connections with the Port of Santa Cruz de Tenerife. The Iglesia de la Concepción of Agaete. It was built in 1874 to replace an old chapel that was destroyed in a fire. Interestingly, the interior is divided into three parts. Also The botanical garden 'Huerto de las Flores' is a must-see. It is a tropical garden with over 100 tropical species brought from different parts of the world. In the past, it was an important meeting and meditation place of great poets. The Ermita de las Nieves is where the triptych of Nuestra Señora de la Nieves has been found. 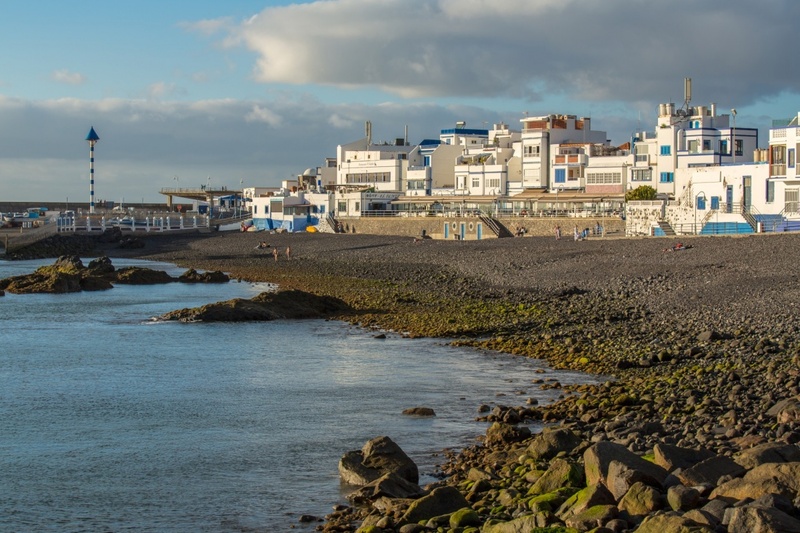 It's a really nice place to visit and is located in Puerto de Las Nieves, the coastal area of this municipality. It's a beautiful place to take a walk and swim in the Atlantic. Due to its proximity to the marina, the fishing dock and the old wharf, it is the most visited beach of the area. Here you'll also find various restaurants and small shops with typical craft. The famous “Dedo de Dios”,a rock formation rising from the sea, was located here. The storm 'Delta' destroyed it left it at the bottom of the sea. This is the zone with the largest variety of beaches. Most of them are rocky and not very easy to access. In the area, you can discover beaches with sand, stone, gravel, beaches ideal for surfing, beaches with calm waters, and even several natural pools ideal for scuba diving. Most popular beaches of the area include: Playa de las Nieves, Guayedra beach, Playa El Juncal, Agaete Sotavento beach, Playa de Las Salinas, Playa del Muelle, Playa de la Caleta and Turmán. If you go out to eat in Agaete, one of the most delicious dishes you must try is the Grilled Fish Plate, consisting of several local fish. Find information about selected Hotels, apartments and rooms in Agaete to choose the perfect place for your accommodation.